The New Era Mini was designed by Ken Nightingale with the intention of being put into small-scale production. It was not the first car that he designed. He wanted to go motor racing after World War 2 and he used the unlikely base of a Humber air field defence vehicle (see left). Fitted with an aluminium body and a supercharger, its acceleration was breath taking, but its cornering was nail biting. 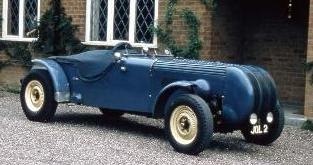 The Humber was followed by a lightweight purpose-built chassis fitted with a small Panhard engine with the intention of competing in the small-capacity sports car class of hill climbs (see right). It was sold before completion due to various pressures. In the late 1950s Ken’s efforts concentrated on starting a small automotive business at 1A Caroline Street in central Birmingham. Initially it was a small garage which acted as agents for Alexander Conversions Ltd, a company that manufactured ‘go faster’ conversions for the BMC cars of the time. The business was initially called Ecurie Rossignol Ltd (Team/Stable Nightingale in French), but later it was changed to New Era Ltd, the Era being an abbreviation for Ecurie Rossignol Accessories.